Have you ever woken up in a strange town in an unfamiliar bed and become disoriented? "Where am I and what day is it?" is the panic stricken thought that strikes your mind. 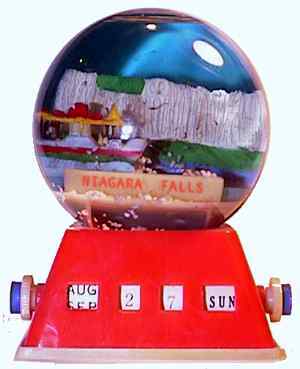 The resourceful snowdome collector/traveler never has to suffer this fate if he or she puts a calendar dome on the hotel nightstand. Softly backlit by the reflection from the whirring combination bathroom fan/light, the glow from a friendly calendar dome will soothe you back to sleep when the macarena dancers in the lounge below your room get too loud. When you return home, the calendar dome will remain stuck on the last date you entered as a semi-permanent marker of that awful music. Surfing and hula dancers! 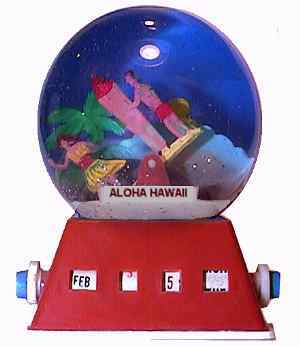 To be honest, I haven't been back to Hawaii since my honeymoon, long before I started collecting snowdomes. On that trip, we brought home decorative carved wooden spears, each about three feet long. That's a good reason to switch to snowdomes. 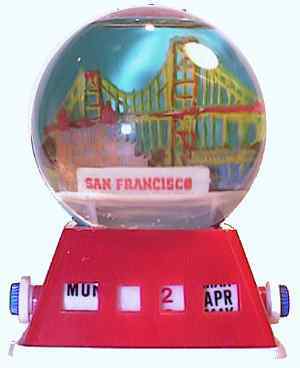 With the El Nino winter of 1998 flooding San Francisco with torrential rains, it's ironic that they were talking water rationing when I bought this dome back in the 80's. The shop keeper joked about charging extra for the water. Drive in on a hot summer day and note the rainbows that form in the mist next to the highway. Or come in at night and hear the roar of the water. Either way, Niagara Falls offers both Natures's grandeur, and tourism's tackiness. Later on, you can see Ripley's Believe it or Not, stand in the Mystery Spot, buy snowdomes and take rides. One of the best, in my opinion, is the Maid of the Mist, shown in this dome. They give you a raincoat and cruise right up to the base of the falls. Believe it or not, the tour boat actually rescued someone who had been swept over the falls.